This years Outdoor Youth Leadership Program (OLYP) is currently accepting Applications. The purpose of the Guide in Training Program is to provide an unparalleled skills and leadership development opportunity for highly motivated high school juniors and seniors. The program is based in Crested Butte, Colorado. A truly unique and authentic mountain town in the heart of the Rock Mountains. 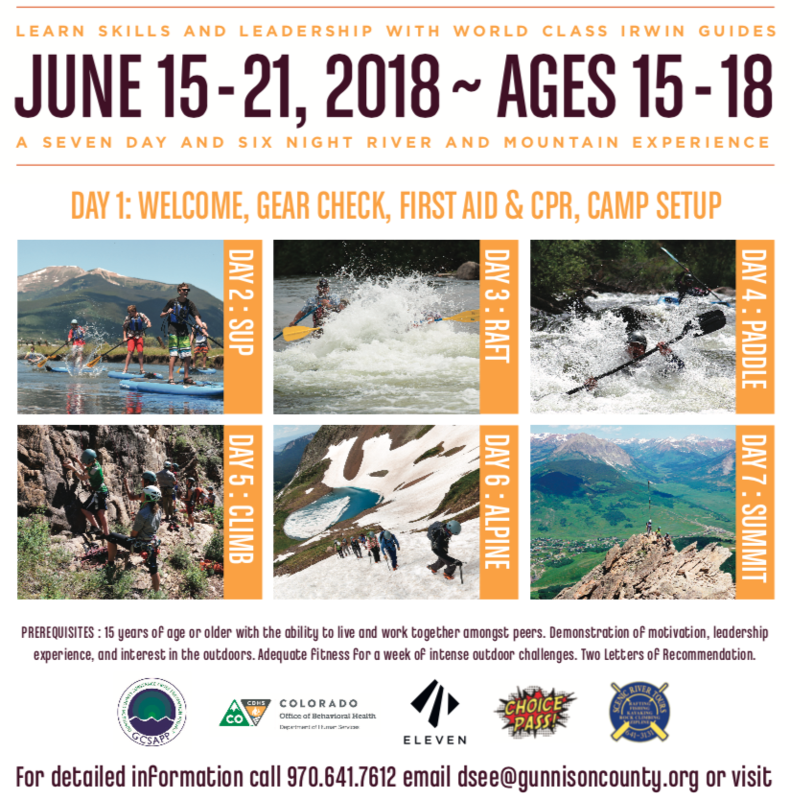 Crested Butte is also the home of Irwin Guides, a global guide service that provides world-class experiences for adventurers of all ages. The Guide in Training will gain knowledge and skills in each of the listed areas below so as to teach/lead others and will be trained in Wilderness First Aid & CPR. Day 1: Welcome, gear check, first aid, CPR & camp setup. Day 2: Introduction to Stand Up Paddle Boarding on the Slate River. Day 3: Rafting and inflatable kayaking on the Gunnison River. Day 4: Advanced rafting and inflatable kayaking on the Taylor River. Day 5: Rock Climbing: knots, belying, rappelling and climbing techniques. Day 6: Alpine Mountaineering, Guides Ridge Route, Mt. Crested Butte. Day 7: Peak Climb/Snow Ascent, closing ceremonies and graduation. Customized dates available in June for private groups. Contact our office for more information on this program. The Irwin Guides Guide in Training Program is designed for Independent School Groups. Students apply to the program through their school and attend with teachers. An ideal group is comprised of 10 students and 2 teachers. Prices very depending on each individual group. Inclusions: meals, lodging, transportation, professional guide(s), all necessary technical gear for each activity (e.g., harnesses, helmets, rock shoes, PFDs, boats, paddles, etc.). Prerequisites: Students must demonstrate leadership experience and an interested in the outdoors. Plus two letters of recommendation from teachers, advisors or coaches.